Neanderthals (Homo neanderthalensis), an extinct hominid, lived throughout most of Europe and parts of Asia and northern Africa. At first, Neanderthals represented somewhat of an enigma for evolutionists and creationists alike. However, whilst the vast majority of creationists now agree that Neanderthals were simply genetically isolated humans, some evolutionary circles have been slow to abandon the misconception that Neanderthals were stooped "apemen." Nevertheless, since the mid 1950s, studies have revealed that Neanderthal features fell within the accepted range of human anatomy. There has been disagreement about whether the Neanderthals should be considered a subspecies (i.e. homo sapiens neanderthalis) or their own species. The recent sequencing of Neanderthal mitochondrial DNA seems to point towards a separate species designation because of the substantial differences found compared to modern humans, and the apparent lack of breeding between sapiens and Neanderthals . 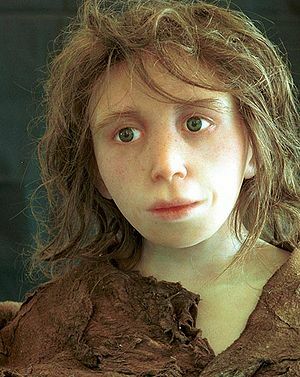 Reconstructing the face of the Gibraltar 2 (Devil's Tower) Neanderthal child. Yet, the 1998 discovery of a Neanderthal-human "hybrid" skeleton at Abrigo do Lagar Velho in Portugal indicates that humans were indeed capable of interbreeding with Neanderthals . Moreover, critics of the Neanderthal mitochondrial DNA data have noted that the sample size of Neanderthals is extremely small, resulting in underrepresentation. “ Based on the comparison of modern human mt DNA and that taken from the Neanderthal, evolutionists have argued that the "Neanderthal line" diverged from the line of "hominids" leading to modern humans about 600,000 years B.P. without contributing mt DNA to modern Homo sapiens populations. This strongly implies that Neanderthals were a different species from modern humans. It is possible that Neanderthals contributed to modern human populations, but their mitochondrial DNA sequence disappeared as a result of the loss of genetic diversity. As Kahn and Gibbons write: "Living humans are strangely homogeneous genetically, presumably because ... their ancestors underwent a population bottleneck that wiped out many variations." The mt DNA differences are at mutational hotspots where substantial mutational change can occur in short periods of time, resulting in rapid genetic shifts within a population. One Neanderthal mt DNA study concluded: "The separate phylogenetic position of Neanderthals is not supported when these factors are considered [i.e. the high substitution rate variation at these hotspots]." Hence, recent mt DNA findings are not in conflict with the conclusion from the evidence of fossil hybrids and artifacts that Neanderthals were fully human. In 2004, newspapers reported on the dating flaws of Professor Reiner Protsch von Zieten, the former director of the Institute of Anthropology and Human Genetics for Biology at Goethe University in Frankfurt, whose carbon dating results had been used to date such specimens such as Hahnhofersand Man and Binschof-Speyer Woman (actually a man). The Hahnofersand specimen was estimated by von Zieten to be around 36,000 years old. Independent Oxford research found the specimen to be less than 7,500 years of age -- long after evolution says the neanderthals went extinct. (The age is still outside the estimates of most young-earth creationists, but a drastic reduction nonetheless.) According to the Herne Anthropological Museum in Germany, the remains still exuded an odor when the skull was cut open for further review. Binschof-Speyer was estimated at 21,300, but independent research dated it at around 3,000 years of age. Von Zieten was also accused of trying to sell a collection of chimpanzee skulls to an American collector. He was suspended in 2004, and forced to retire in early 2005. 'Scant news coverage' of the subject drew frustration from Answers In Genesis. Evolutionists are now claiming a 1997 study Neanderthal mtDNA shows they were not human. This claim is based on the degree of differences in Neanderthal and living human mtDNA. However, as is often the case, nothing destroys a good Evolutionary argument like the original paper. The bases for the claim is a comparison with Neanderthal mtNA positions 16,024 to 16,383 which is just 360 nucleotides. 25 of these differences are in 225 positions that also vary among living humans. 1 of the remaining two was in a position that varies among chimps which the paper claims makes it consistent with Evolution, however one such unique commonality based on chance alone is not statically unlikely at worst 1/27. While it true that these results do put the Neanderthal average out side the range of living humans that does not mean that they were not human. The living humans and Neanderthal do overlap meaning that both are humans. There are living humans with more mtDNA differences than some Neanderthals. You can't say one is human and one is not just because one is living and one is not. The comparison was made between living humans and Neanderthals who died thousands of years ago. Clearly some human mtDNA lines have gone extinct, this means that living humans do not represent the full range of human mtDNA lines, thus Neanderthals could simply represent an extinct human mtDNA line. The paper's chart (Figure 7a) is only one possible way the data can be represented but it is consistent with this model idea. The Bible indicates that people before the Flood lived 900+years and the first few post Flood generations still lived 200-400 years. One theory is that Neanderthals were people who lived in the 300-400 year range. Now as we age our DNA accumulates more mutations, so the differences could be a result of extreme old age. Given the fact that even in a young Earth model Neanderthals lived more than 3000 years ago the differences could simply represent normal Human genetic drift over the last 3000+ years. Neanderthal mtDNA data are consistent with Neanderthals being totally human, the evolutionists conclusion that it indicates they were not human is based more on their Evolutionary presuppositions rather than objective analysis of the data. 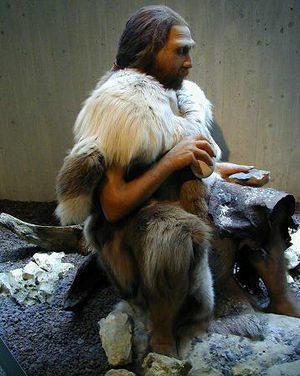 In 2006, news was released that scientists had found Neanderthal DNA to be as much as 99.9% identical to modern humans. However, this does more than shorten the gap between Neanderthals and humans, since it is recognized by the mainstream scientific community that any two humans on earth have genes that are 99.9% identical to each other. Such recognition of modern genetic divergence also serves to acknowledge Neanderthals as fully human genetically. Baffling 400,000-Year-Old Clue to Human Origins Scientists have found the oldest DNA evidence yet of humans’ biological history adding new mysteries. The NY Times December 4, 2013. A Portrait of the Artist as a Young Neanderthal? Neanderthals were thought to be incapable of Paleolithic cave art, but new work coming from sophisticated dating techniques suggests otherwise: Neanderthals may have been artists. Archaeology, Volume 65 Number 5, September/October 2012. Neanderthals smarter than previously believed New dating method shows famous paintings were created at the time of the cavemen, not Homo sapiens. The Vancouver Sun, June 15, 2012. Neanderthal-Heidelberg Distinction Blurs “Heidelberg Man” fossils appear to overlap with Neanderthals. Creation Evolution Headlines, June 14, 2012. First Neanderthal cave paintings discovered in Spain Cave paintings in Malaga, Spain, could be the oldest yet found. New Scientist February 10, 2012. Neanderthals, Humans Interbred—First Solid DNA Evidence Most of us have some Neanderthal genes, study finds. National Geographic News, May 6, 2010. Where did they go? Debate rages over the fate of the Neanderthals. World Magazine, October 23, 2010. ↑ Science 27 August 2004: 1237. DOI:10.1126/science.305.5688.1237c. ↑ 2.0 2.1 Archaeological Institute of America (2005, May/June). "Look Before You Date." Archaeology. Insider. Vol. 58, No. 3. ↑ Nature 430, 958 (26 August 2004) | doi:10.1038/430958a; Published online 25 August 2004. ↑ Paterson, Tony (2004, August 22). "Neanderthal Man 'Never Walked in Northern Europe'." The Telegraph. ↑ 5.0 5.1 Murdock, Matthew (2005). "Scandalous First Dates for Neanderthals." www.Creation.com. ↑ Harding, Luke (2005, February 18). "History of Modern Man Unravels as German Scholar is Exposed as Fraud." The Guardian. ↑ Line, Peter (2005, April 13). "Upper Paleolithic Blues: Consequences of Recent Dating Fiasco on Human Evolutionary Prehistory." Answers in Genesis. This page was last modified on 19 July 2015, at 15:16.